Winfried (Peter Simonischek) doesn’t see much of his working daughter Ines (Sandra Hüller). Concerned that she is leading a joyless, corporate life, he travels to Bucharest, where she’s working as a consultant, to pay her a surprise visit. However, his spontaneous decision doesn’t help their relationship. Winfried is a practical joker and annoys his daughter with silly pranks and jokes about her lifestyle. Reaching an impasse, Winfried agrees to go home to Germany. Enter Toni Erdmann - Winfried’s flashy alter ego. Disguised in a cheap suit, crazy wig and fake teeth, Toni barrels into Ines’ professional life, claiming to be her CEO’s life coach. As Toni, Winfried doesn’t hold back and Ines soon begins to meet the challenge and the harder they push, the closer they become. What defines a great comedy? A movie that makes you laugh a certain amount of times? A self-referential movie bursting with banana skins? I can’t help but think that there should be something more, something deeper beneath the gags. 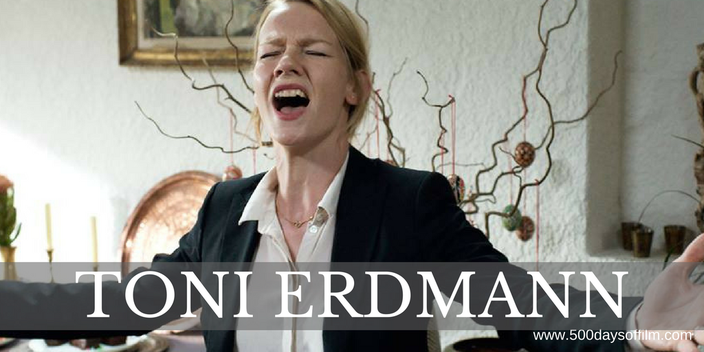 Toni Erdmann is an example of just such a comedy - a film that is both funny (often excruciatingly so) and also about the role of humour itself. As a result, Maren Ade’s brilliant film is so much more than a simple gag fest. Peter Simonischek is brilliant as Winfried/Toni Erdmann. He is laugh out loud funny to watch and yet we cannot help but feel the sorrow of his existence. Beneath his comedic surface, Winfried understands the fragility and brevity of life and worries that Ines is missing out on what is most important. For me, Sandra Hüller steals every scene in Toni Erdmann. Her performance is superb - raw and hilarious, brave and heartbreaking. Ines is desperate to fit into a sterile corporate mould of sharp business suits and endless meetings. However, she is also her father’s daughter - a woman who needs to embrace the ridiculousness of life in order to thrive. Toni Erdmann is a wonderful and hugely entertaining film - a glorious comedy with satisfying depth. Toni Erdmann has a rather hefty running time of two hours and 42 minutes. However, the time flies (as we are having so much fun) and it would be impossible for me to choose a scene to cut. The idea of an American remake of Toni Erdmann (starring Jack Nicholson and Kristen Wiig) fills me with dread. What is the point? The original is lightning in a jar - darn near impossible to replicate. Have you seen Toni Erdmann? If you have, what did you think of Maren Ade’s film? Let me know by leaving me a comment in the box below. Or come find me on Twitter or Facebook!